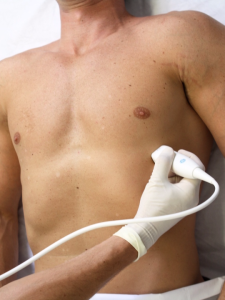 SONOSIM SUMMARY: This case report from the American Journal of Emergency Medicine showcases a 76-year-old male who presented to the ED with dyspnea. Bedside Focused Cardiac Ultrasound (FOCUS) was performed and revealed right ventricular dysfunction consistent with a positive McConnell’s sign. Diagnosis of pulmonary embolism (PE) was later confirmed with CT angiography. This report serves as a reminder to practitioners that signs of PE may be detectable using beside FOCUS, and that earlier detection of PE may help improve patient outcomes. Ünlüer EE, Senturk GÖ, Karagöz A, et al. Red flag in bedside echocardiography for acute pulmonary embolism: remembering McConnell’s sign. Am J Emerg Med. 2013 Apr;31(4):719-21. doi: 10.1016/j.ajem.2012.12.007. Dyspnea is a common symptom among emergency department (ED) patients. The differential diagnosis of dyspnea in ED patients is broad, and pulmonary embolism (PE) is a crucial consideration among these. Recognition of right ventricular (RV) dysfunction is critical in patients with PE. Here, we present a 76-year-old male patient with the complaint of dyspnea. Focused cardiac ultrasonography performed by the emergency physician revealed enlarged RV, hypokinetic lateral wall and hyperkinetic apex of RV (McConnell’s sign). We have screened the deep venous system of the patient with the linear probe for possible deep venous thrombosis and showed that the right dilated uncompressible popliteal vein had a thrombus formation.